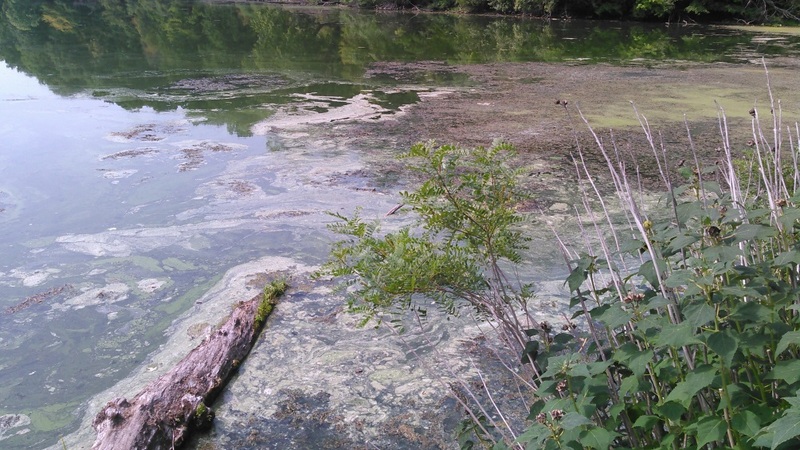 Harmful Algal Blooms (HABs), also referred to as blue-green algae, are blooms of algae which can produce toxins that can be harmful to people and animals. HABs usually develop in nutrient-rich waters, particularly during hot, calm weather. The Division of Environmental Health investigates if HABs are reported which will have an impact on a regulated public swimming area or a drinking water supply source. If you see it, avoid it. The Monroe County Department of Public Health (MCDPH) recommends avoiding contact with any water with floating scum or discoloration – this includes your pets and livestock. Sometimes it is not easy to tell just by looking whether the algae contain toxins. Laboratory analysis of a water sample is the only way to tell for sure. Report it. The NYSDEC monitors and tracks HABs throughout the State. Potential HABs can be reported to the NYSDEC using the Suspicious Algal Bloom Report Form. Get notified. You can receive web-based notifications by subscribing to NYSDEC's "Making Waves". This is an email subscription that is sent out weekly by the NYSDEC and provides updates on locations of HABs. You can subscribe at the bottom of the page here.